Zimmer Gunsul Frasca Architects LLP/Opus A&E, Inc. The first green roof in downtown Denver, finished in the fall of 2006, was hardly an anomaly. Instead, it represented the first visible sign of a transformation in the market for office developments in the Rocky Mountains. Hidden inside this new regional home for the U.S. Environmental Protection Agency (EPA) were more significant achievements, including energy usage levels that beat ASHRAE 90.1 by a heady 39 percent. The outward expression of the nine-story, LEED Gold-rated building reinforces EPA's message of resource conservation in ways both obvious and subliminal. The double-L plan features markedly distinct window and material designs for sunward - and windward-facing zones. Architect Zimmer Gunsul Frasca employed a contextual red brick at the lower floors, a nod to the historic masonry construction in Denver's Lower Downtown, or LoDo, area. 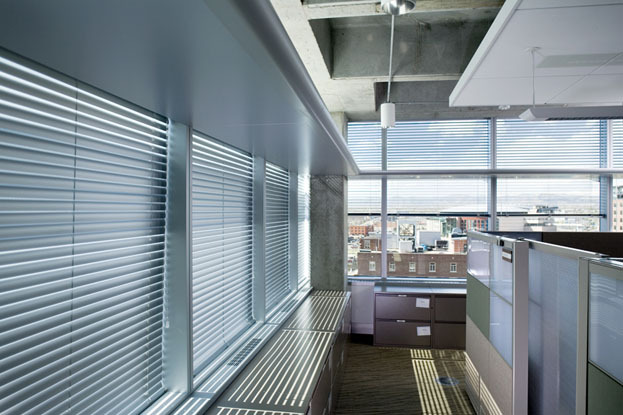 Above, the designers dispensed with expensive light shelves in favor of high-performance glazing coupled with brushed-aluminum vertical and H200 2" manual & motorized horizontal blinds by Hunter Douglas Contract. The vertical units hang along clerestory areas at an angle predetermined by the lighting designer and architect. 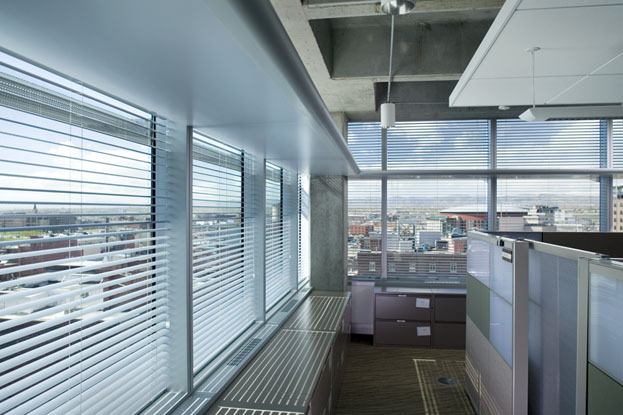 Below are the H200 2-inch horizontal louvers, which automatically orient to a precisely regulated angle for optimal interior illumination and energy performance. 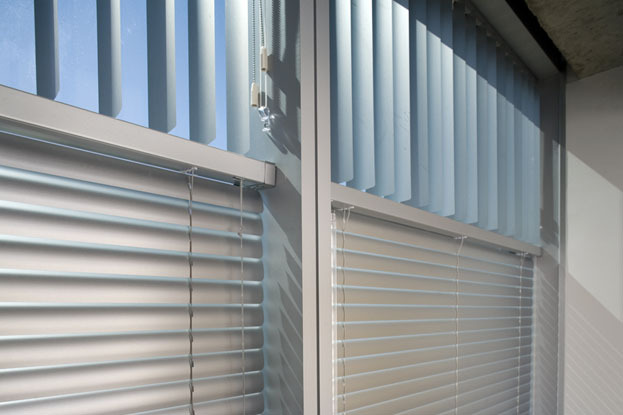 All 300 blinds are motorized with sun-tracking controls set by celestial clock. 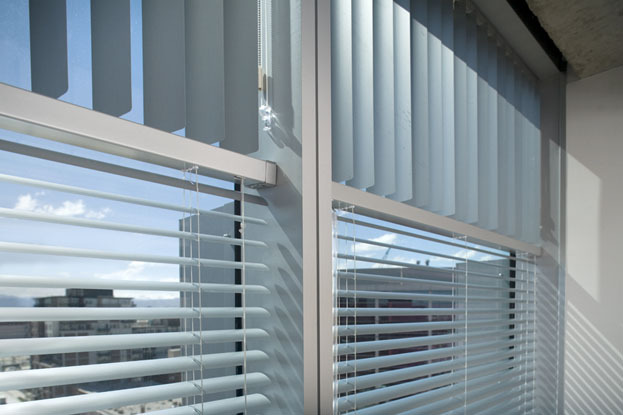 The tilt of the blinds changes automatically three times a day, controlling glare and reducing heat loads. 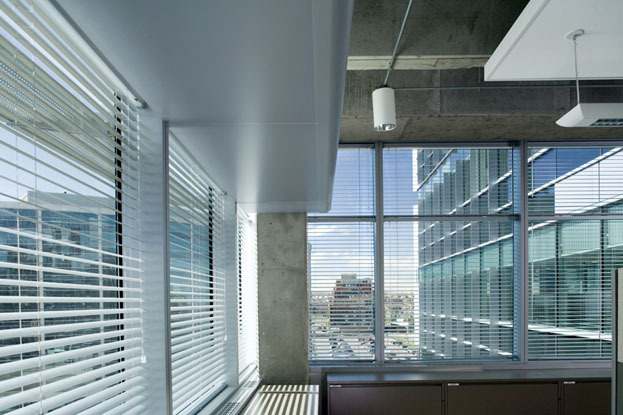 For building occupants, this combination of window treatments and glazing means light is projected deep into the space, with fewer interior "hot spots" on sunny days. 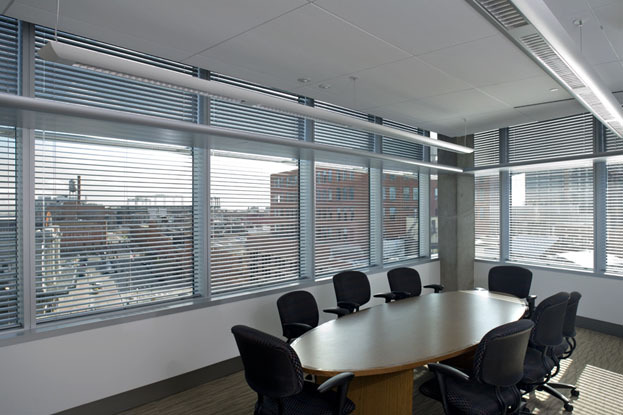 The overriding impetus for the specification, however, reveals an industry-wide trend: Architects are searching for better, more cost-effective means to redirect daylighting and enhance comfort throughout the year. 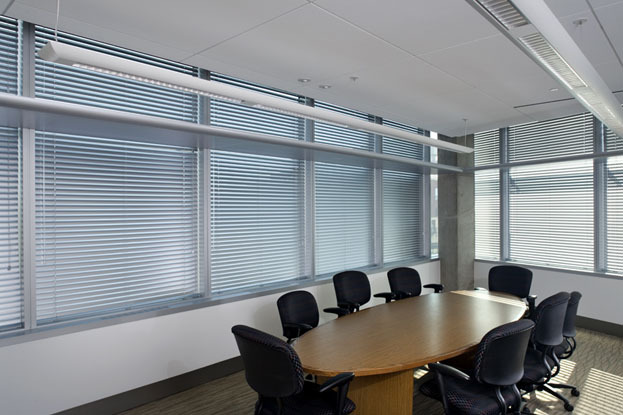 Strategies like motorized blinds tied to the building-management system are increasingly common not only in class-A office space like the EPA headquarters but also in healthcare and educational settings. Unlike light shelves, they adjust to solar angle and seasonal variation and leave facades flatter and easier to maintain. The EPA project teems with equally environmentally conscious strategies addressing today's hot-button concerns. Its two-story lobby and a striking full-height atrium admit copious daylight for government workers to enjoy. Photovoltaic panels help shave peak electrical loads. Mechanical systems include underfloor air distribution - still a rarity in the United States - and high-end controls and monitoring. Waterless urinals and dual-flush toilets conserve water. The green roof retains and filters storm-water runoff, while also reducing HVAC costs. Construction materials were chosen to maximize the percentage of recycled materials and environmentally certified wood products in the overall design. Furniture is made of low-VOC emitting materials with recycled content in fabrics and recycled glass content in bathroom vanities. Air quality remains high due to initial product selection - low-VOC materials for furnishing as well as all construction products, including adhesives, caulks and sealants. The same holds true in operations: the building management cleans and maintains the building with only benign, occupant-friendly maintenance and janitorial products. In fact, the building's operational practices bring special meaning to the EPA's mission of promoting resource conservation: The new building was designed and built to be consistent with EPA's Headquarters recycling program. The developer, Opus Northwest, committed to recycling 75 percent or more of the waste generated during the construction period. And by encouraging bicycle commuting and use of mass transit at nearby Union Station, the EPA makes vivid its commitment to reducing energy use and controlling pollution sources. Such a long list of achievements could overshadow a lesser building's architectural intent. This new office block's contribution to LoDo's cityscape and street life, however, stands out equally as its main accomplishment. Below the green roof, the differentiated facade materials and shapes bridge the gap between LoDo's historic fabric and newer glass office towers that signal Denver's commercial center. 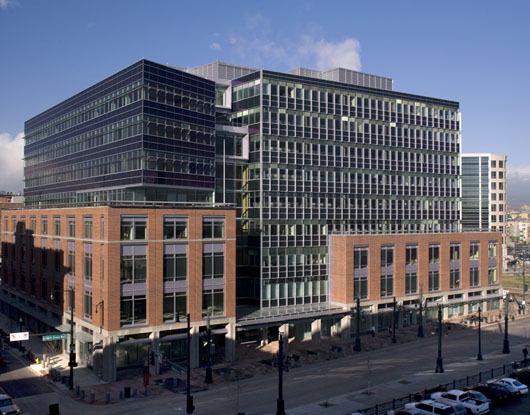 The four-story brick and precast base, bracketing rather than simply wrapping the building, nods to the classic Denver building stock without pandering to it with historicist detailing. A metal overhang cornice doubling minimally as solar control articulates the brick base and echoes the fins built into the state-of-the-art curtain walls above. Using setbacks and cutaways to further enliven the exterior, the architects created a building that serves the streetscape in more ways than one. Inside, the architect's thoughtful solution is expressed in the soaring atrium and amply daylit office floors that make the EPA's home a pleasant place to work. The congenial image of this headquarters at 1595 Wynkoop Street hardly suggest its impressive feats in controlling energy use, improving occupant health and reducing the impact of such developments on the environment.